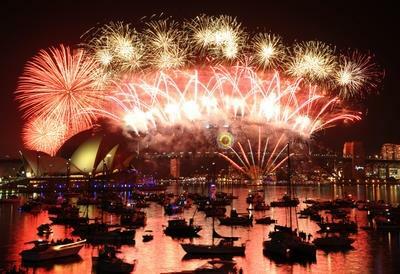 Sydney fireworks extravaganza heralds beginning of New Year’s Eve celebrations around the world. 1.5 million 2012 New Year’s revellers gathered on the city’s harbour shores to view the world renowned fireworks display. Themed ‘Time to Dream’, the extravaganza of light, sound and smoke was set to a medley of hit Australian rock songs, with old and new classics from the likes of INXS, Wolfmother, AC/DC, Gangajang, Temper Trap, Icehouse and Spiderbait. Costing over $6million (£4million) to stage, the Sydney New Year’s Eve fireworks is arguably the world’s most dazzling display, and certainly one of the most expensive. The worldwide coverage the fireworks earn the city — BBC News devoted 15 minutes to uninterrupted coverage of the display — more than justifies the event, say Sydney authorities. Sydney is the first major city in the world to turn on such a spectacle for New Year’s Eve and is considered the opener for celebrations around the globe. The world now looks to metropolises such as Beijing, Moscow, Paris, London and New York to see if they can match Sydney’s breathtaking fireworks theatrics. Earlier, New Year’s Eve celebrations in Australia got into full swing with public events held around the country, welcoming in 2012.